Borage: here comes the spring! 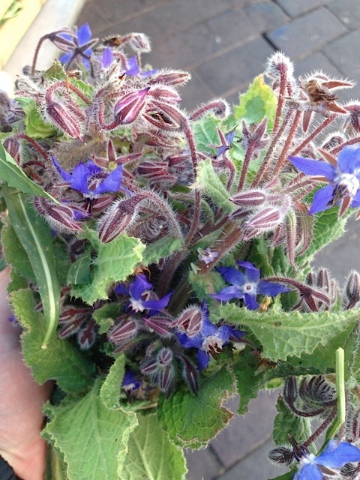 The borage‘s season is just starting now. The right time to get those young fresh leaves, as they are easier to eat fresh at the blooming time. After a while the hairs on the stems will get tougher and then you gonna have to cook it to get rid of those. 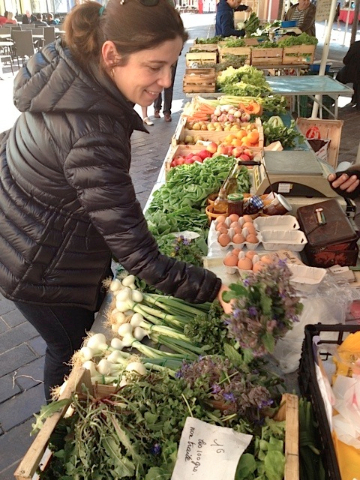 We found it on the Cours Saleya yesterday morning, on a charming lady little producer’s table. You can use fresh borage leaves (bourrache in french) to do ravioli’s stuffing, omelets, salads or in decoction against coughing; borage is also supposed to have great benefits for the skin health. To make a decoction put a little bunch into boiling water, then cut the fire, and when it is ok to drink, get the bunch out. You can also use the blue flowers as sugary decoration on your salads or deserts.